Erionite is a naturally occurring, microscopic, fibrous mineral. It usually is found in volcanic ash that has been altered by weathering and ground water. Erionite forms brittle, wool-like fibrous masses in the hollows of rock formations. Its color varies from white to clear, and it looks like transparent, glass-like fibers. Some properties of erionite are similar to the properties of asbestos; however, erionite is not currently regulated by the U.S. Environmental Protection Agency (EPA) as one of the six asbestos fibers. Why is erionite a concern? Like asbestos, erionite may pose health risks to those who breathe in the fibers. It appears to be associated with increased risks of fibrogenic lung disease, lung cancer and mesothelioma (a rare type of respiratory cancer usually related to asbestos exposure). Although toxic effects were documented in a study of three small villages in Turkey in the 1970s, there have been few studies of erionite in the United States. Why is erionite a concern in North Dakota? Over the past few decades, gravel pits have been excavated in western North Dakota where naturally occurring deposits of erionite are found. The gravel was used to surface local county roads, parking lots and other areas. In 2006, the North Dakota Department of Health (NDDoH) learned of the potential health effects of erionite and its occurrence in North Dakota through discussions with the University of North Dakota (UND) and the North Dakota Geological Survey (NDGS). The NDDoH immediately began investigating the situation, in cooperation with the NDGS. The NDDoH recognizes the potential public health implications of erionite exposure. However, it is important to note that the department has not observed any health-related impacts from erionite exposure in North Dakota. Where are the erionite deposits found in western North Dakota? 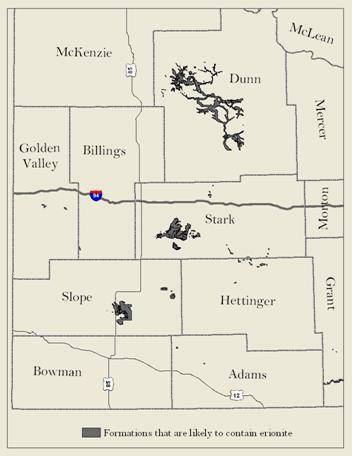 Gravel deposits that contain erionite are located in or near the Arikaree, Brule and Chadron geologic formations, which correspond to the Chalky Buttes, Little Badlands and Killdeer Mountain areas in Slope, Stark and Dunn counties. These geologic formations are also present in other high buttes in western North Dakota, but testing has not been done to see if erionite is present there, as well. What has been done to address the erionite concern? Since 2006, testing has been done on samples from Dunn County, the area where North Dakota's naturally occurring erionite first became a concern. The state tested some of the rock faces of the Killdeer Mountains and nearby gravel piles that had been excavated from areas suspected of containing erionite. 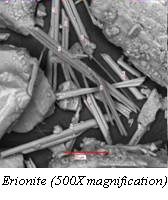 Laboratory tests showed that erionite fibers were present in many of the samples. The state met with county commissioners in 2006 to bring the situation to their attention and discuss sampling results. A public meeting also was held to provide local residents with information about erionite in Dunn County. The state asked EPA to conduct an investigation of the possible health effects of erionite exposures in Dunn County. In cooperation with the state, EPA took samples in October 2006 to determine if the erionite in Dunn County is similar to the erionite that has been associated with health effects in other parts of the world. EPA's preliminary testing showed that the erionite fibers are similar and are of a size that can be easily inhaled if they are disturbed and become airborne. The NDDoH, in cooperation with EPA, will be conducting further investigations to assess the health effects of erionite exposure in North Dakota. In addition, the NDDoH is working with counties and businesses to restrict further use of gravel containing erionite and is exploring various dust control measures for effectiveness and cost. Guidance plans also are being developed to help businesses and homeowners limit erionite exposure. How do people protect themselves from possible exposure to erionite? The extent of the erionite exposure in western North Dakota is unknown, but given the inherently toxic nature of the material, reducing exposure is recommended. Where found, erionite should not be disturbed. Mining should be prohibited in specific areas. Recommendations for county highway departments, businesses and private landowners include finding alternative sources of gravel and limiting or eliminating exposure to erionite fibers.